The terrain is just what we expected: harsh. Sandy soil covers the rocky earth as far as the eye can see. The road that takes us to the interiors of Kolayat tehsil in Bikaner district is flanked by kikar trees (Prosopis julifera) and aak bushes (Calotropis procera). This does not sit well with our story. We are in Rajasthan to find out about the traditional food or desi khana of the region. In the three-day trip, we hope to find out how people, who have occupied the area for centuries, have devised innovative ways to find food in this harsh environment. But kikar is an invasive tree that even goats do not consume and aak is known more as medicine than food. We enter Godaro ki Dhani in Bhelu village, some 90 km from Bikaner, with some trepidation. Godaro ki Dhani, spread over 80 hectares (ha), is owned by four brothers. One of the brothers, Babu Ram, greets us from a chair where he is busy peeling a small, striated fruit. He is surrounded by charpais (cots) that are covered with the peeled fruit. The sour fruit, which he calls kaachar (Cucu-mis melo variety callosus), belongs to the melon family. It is used in place of amchoor (dried mango) in the region. Babu Ram sells the dried fruit to traders who powder it and sell it in cities. The powder is called kachri. On our request, he takes us to the fields where the wild kaachar vines grow. We are accompanied by two young family members, Shaitan and Moti. Babu Ram tells us that the plant easily grows in the field as each fruit of kaachar has hundreds of seeds that grow profusely in the next season. This means that just a few fruits are enough for a crop for the next year. Besides kaachar, the field has succulent kakadiyas (Cucumis melo variety momordica), which Babu Ram offers us while we walk under the sun. Shaitan and Moti hunt down some fruits of wild tinda or tindsi (Praecitrullus fistulosus) for us. They tell us that the tinda fruit is preserved by cutting and drying. The dried vegetable is normally cooked when there is a shortage of food. The family then takes us to a neighbouring field to show us a kumbat tree (Acacia senegal). The tree, which fruits in summers, has only a few green beans hanging from its spiny branches. The beans are consumed green and its seeds, called kumatiya, are boiled and preserved. There is a bush of bor or ber (Ziziphus mauritiana) right next to this and the ripe red fruits are offered to us. On our way back to Godaro ki Dhani, we rest under a khejri tree (Prosopis cineraria) and watch a woman collect guar (Cyamopsis tetragonoloba). Buddha Ram, the eldest of the four brothers, brings water for us and narrates stories of how the bark of the khejri tree used to be milled and used as flour during famines. 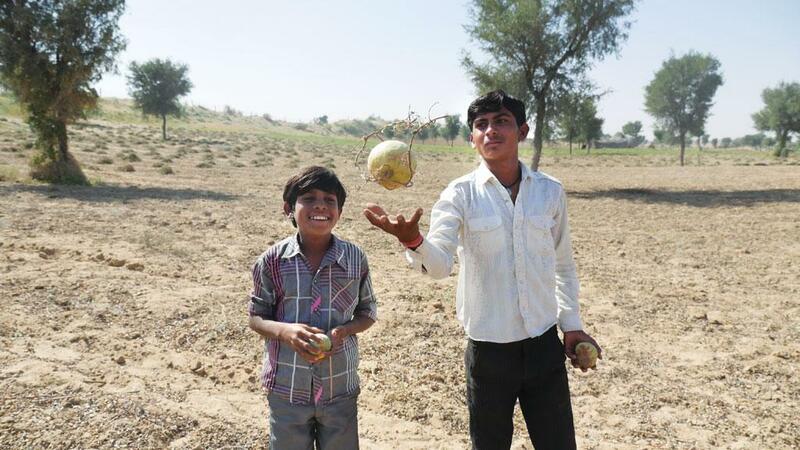 The bean of this tree, called sangri, is still consumed widely in Rajasthan. Buddha Ram invites us for lunch and as we wait for the food, we eat more kakadiya and wild matira or watermelons (Citrullus lanatus). Matira, which is used by the family as a vegetable, is not as sweet as the watermelon we get in the cities. However, the succulent fruit is extremely refreshing under the afternoon sun. We also enjoy freshly roasted peanuts, which we had collected on our way to Buddha Ram’s cottage, along with tea that is sweetened with jaggery. For lunch, we eat a spicy guar sabji, a kaachar sabji, along with large bajra (millet) rotis and curd. Our meal is made up of ingredients that are integral to the rain-fed agriculture practised in the area. But the family is slowly shifting to commercial farming of groundnut, which has become possible after the family installed a tubewell on their farm. Last year, the family had experimented with onion. The family says they are shifting to commercial cultivation for higher profits. This year, they expect to earn as much as Rs 5 lakh from groundnut alone, in addition to Rs 50,000 from guar. The traditional kaachar is likely to contribute only Rs 3,000 and its seeds, Rs 5,000 to the family’s income. After the sumptuous meal, we travel to the nearby Nokhda village, which is known for the thorny ker tree (Capparis decidua). We meet 50-year-old Narayan, who has been trading in ker fruits for the past 30 years. The women and children in the region normally collect the fruit from the tree, which grows in the wild. Narayan, one of the four people in the village who buy ker from these collectors, says he pays Rs 60 for a kg of the fruit. He adds that the fruit is treated with salt water for a few days to remove the bitter taste, after which it sells for over Rs 100 a kg. The buyers sort them according to size (the smallest ones are most expensive as they do not have seeds). In fact, all of these traditional foods require processing before they can be stored. Kumbat, sangri, ker, gunda (Cordia mixa) are boiled before being dried and stored to reduce cooking time and, in some cases, to remove the bitter taste. Nokhda residents introduce us to several other traditional foods. One of them is bhurut (Cenchrus biflorus), whose seeds used to be earlier milled and consumed as flour during famines. Then there is the phog tree (Calligonum polygonoides), which does not grow in the area. The fruit and flower of the tree are used to prepare raita and spicy kadhi during the summer season. We are told that phog trees grow around Jaisalmer. Places to visit: Thar Desert is the 17th biggest desert in the world. The extinct river Saraswati is said to have passed through this desert. Efforts have been made to demarcate the path of the river and around 14 wells have been dug in the villages, including some in Jaisalmer and Bikaner. Carbon dating shows that the sweet water of these wells is 8,000-14,000 years old. The Desert National Park has sea shells and fossilised tree trunks that indicate the geological history of the area. Best time to visit: If you are on a culinary journey and want to taste food found in the wild, visit in the summer months till the end of September. However, all traditional food is preserved and is available round the year. 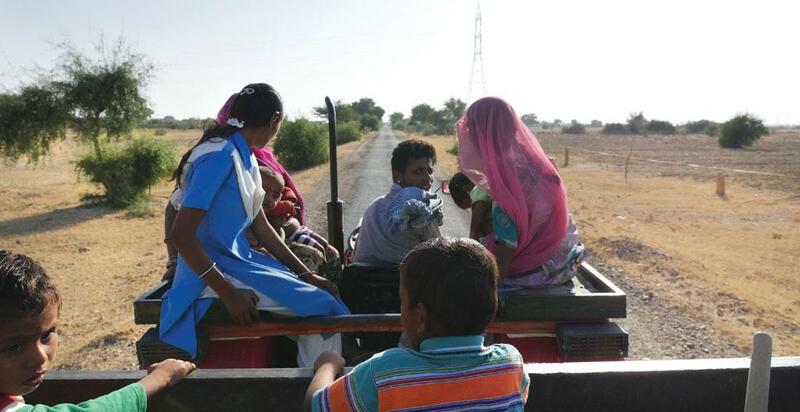 Next day, we enter Jaisalmer and drive down to Chundi village, which is about 17 km away from the city. Interestingly, twenty-five-year-old Khevra, who owns around 200 ha of land, tells us that he has never heard of phog. His kitchen, however, is well stocked with other traditional foods. He has seeds of tumba (Citrullus colocynthis), a fruit that is normally used for feeding animals. His wife tells us that the seeds, which are boiled and made fit for human consumption, are added to bajra flour, which is used for making rotis. She says adding tumba makes the roti crunchy and increases its nutritive value. The family then shows us about 10 other local ingredients from their kitchen. The importance of the ingredients to the family can be gauged from the fact that 9-year-old Mahipal hurriedly takes the packets inside when some younger children from the family start playing with them. Khevra fondly talks about the sweet fruits of peelu (Salvadora oleoides) and wild mushrooms that grow in the sand dunes after the rains. The mushrooms are a delicacy in the area and are dried and milled to make flour. While we did not get a chance to see or taste the mushrooms, studies by researchers in Jodhpur reveal that as many as 48 types of mushrooms can be found in the Thar Desert. We then accompany Khevra to his field in a tractor trolley to see his khejri tree. He practises rain-fed agriculture, but makes more money from selling sand from his land. It is evident that the knowledge of traditional food in the family is gradually decreasing. For instance, no one in the family knows that pods of kheep bush (Leptadenia pyrotechnica), which is growing all over his field, can be used as a vegetable. The family only uses the thin branches of this bush for thatching huts or during last rites. Next, we visit Beldaro ki dhani, a colony of stone workers just five km away from Chundi village, and realise that Khevra and his family are among the very few in the region who still depend on traditional foods. Bhora Ram, a Chundi resident in his twenties, says it is easier to buy vegetables from the market as collecting local vegetables from the wild is time consuming. “It is easier to buy a kg of mushroom for Rs 200 from the market than collect them from the wild,” he says. We then meet Bhagwana Ram, who introduces us to some more traditional foods from the area. He tells us that seeds of a shrub called lana (Haloxylon salicornicum) can be used to make rotis and that ker, which is bitter in taste, can be used to make laddus. He speaks passionately about traditional foods and promises to cook them the next time we visit the region. The next day we travel to Jodhpur to meet S M Mohnot, director of the School of Desert Sciences, who is surprised that we managed to find so many varieties during our journey. 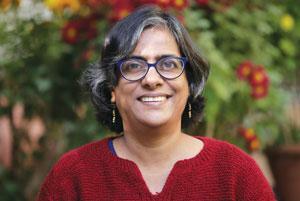 “Traditional foods do not provide substantial support to the people now. They are just remnants of what used to be palatable some 100 years ago.” They are now consumed mostly in dhanis (cluster of huts) as these are far from the market. He points out another reason for the waning popularity of these plants. Kumbat, ker and sangri are more expensive than onion and potato, some being as expensive as dry fruits. Production has gone down as on the one hand, these plants are being cut and on the other hand, new seeds are not finding suitable space for germination. A piece of land that yielded 100 kg of the product 50 years ago barely provides 10 kg of the traditional foods now, he says. The process of collection, processing and storing is also time-consuming. He adds that this is not the case with all traditional plant varieties. For example, while sangri, ker and kumatiya are still being collected, varieties such as phog, tinda and kheep are slowly disappearing. Arvind Ojha, chief executive and secretary of the Urmul Trust in Bikaner, says certain local food varieties are making a return because of tourism. “Guests want to taste traditional foods and we see a big commercial scope here. We are trying to popularise these foods among our self-help groups. For example, we have created awareness about how guar phalli can be dried and sold as a spicy snack from the desert. It is already being sold in fairs.” Ojha adds that the traditional varieties have the additional benefit of being organic. “We are planning to set up solar dryers to ensure the quality of these products. We are encouraging farmers to ensure that native trees and plants remain part of the farm.” He adds that a single khejri tree can increase a farmer’s earnings by as much as Rs 10,000 a year. Besides, crops grow better under the tree and its leaves can be used as fodder. After the three-day journey through traditional foods, we are back to the restaurants of Jodhpur serving alu poori and chowmein, a representation of the standard restaurant food in places like Delhi. It reminds me of what Kheraj Ram of Nokhda village said that as far as food is concerned, Delhi is a city of fakirs (paupers). 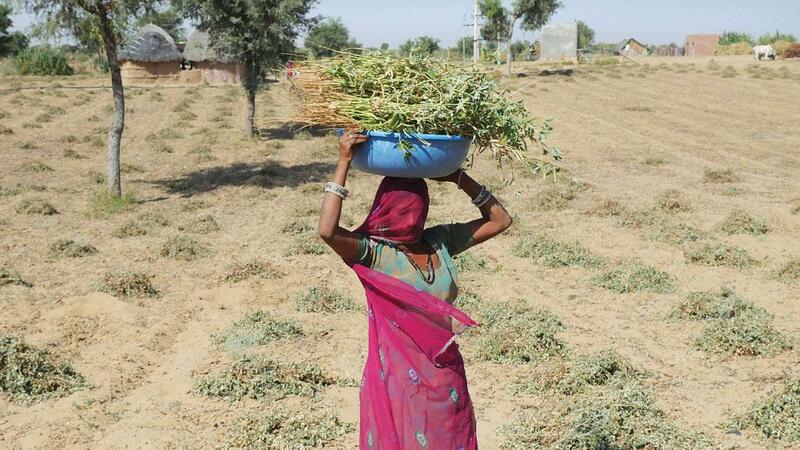 City dwellers cannot even imagine the wide variety of traditional foods that grow wild in Rajasthan. Our only fear is that the rural people of Rajasthan too might soon lose their traditional recipes. 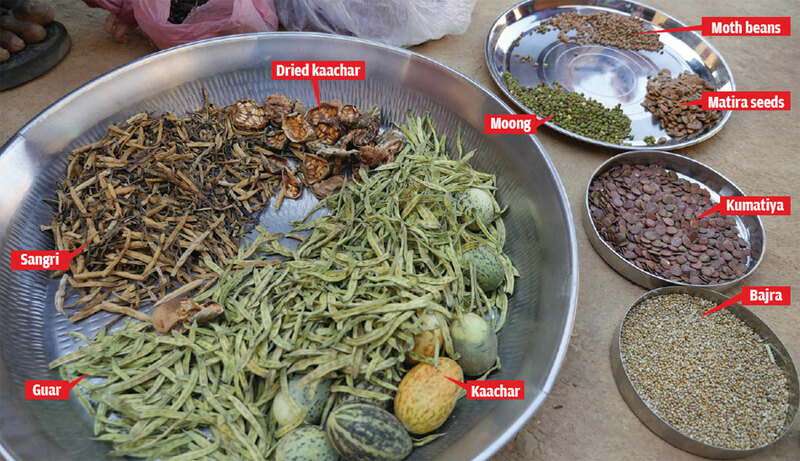 TRADITIONAL FOODS have helped the people of Rajasthan survive famines for centuries. They are, in fact, woven in the colourful tapestry of the people's pastoral life in the state. Their importance can be gauged from the fact that the trees and their fruits and seeds have different names, depending on their physical attributes. The pod of khejri is called sangri, dried tinda is called phophaliya, flowers of phog tree are called phogalo and seeds of kumbat are known by a variety of poetic names such as kumatiya, lehariya, papri and chapatiya. But this beautiful association between traditional foods and the Rajasthani people is fast fading. In April 2016, 19 districts of the state reeled from severe droughts, but the people did not fall back on traditional foods. In fact, several of the traditional foods are no more consumed in the state. Seeds of bhurut and bark of kheri are just two examples. The importance of traditional foods is going down because there has been a rise in commercial farming in the state, thanks to the Indira Gandhi Canal project. Just a few famine foods have survived because of their cultural significance. For example, panchkuta, a mix of sangri, ker, gunda, kumatiya and kaachar, is still prepared during weddings.